At the start of your trip so that you can get acquainted with the city and receive tips on what to see and where to go! 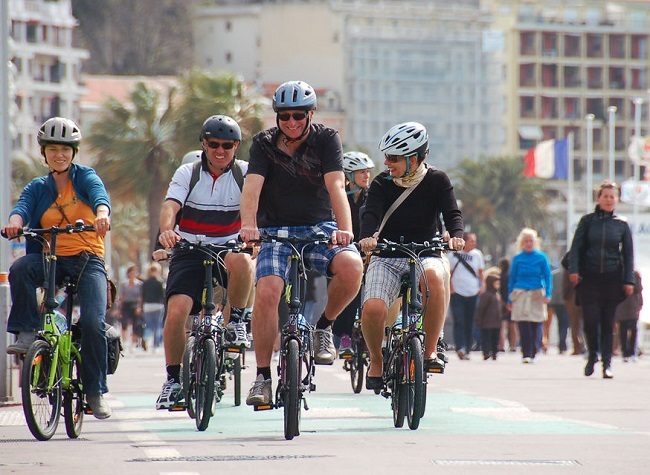 We are comparing Nice City Bike Tour Prices from leading ticket suppliers and Try to find you Cheap tickets prices on the market. Discover the historic city of Nice, the capital of the Côte d'Azur in a unique way. Cycle past long stretches of beach, down grand streets and narrow medieval alleys and through picturesque plazas. Your guide will show you the modern side of the city as well as the historic side, showing you hidden Baroque churches, the majestic palace, the yachts of the rich and famous, gardens, the best viewpoints in the city, and so much more. You'll be pleased to hear that Nice is a flat city so you can enjoy a pleasant ride through its historic streets. Due to sidewalk cycle lanes and traffic-free streets you don't have to worry about riding on busy city roads. A great introduction to Nice if you've never visited before. Good for culture vultures who want to see the sights and hear the history. Nice is relatively flat so, excluding the climb to Castle Hill, the cycling is pleasant with plenty of breaks - You don't have to be super fit or a cycling fanatic to take part, just be able to ride a bike! Your Experience With Nice City Bike Tour? Meet your guide and get equipped with a bike and helmet at beachfront meeting point at the agreed time. You will cycle along the famous Promenade des Anglais taking in the sea view then make your way into Nice Old Town, pedalling down the picturesque backstreets and through the plazas stopping along the way for your guide to tell you about the sights you're passing by and the history of the city. You'll see Baroque churches, trendy street cafes, medieval alleys, yachts of the rich and famous, and panoramic views from Castle Hill and can get some superb recommendations by your friendly knowledgeable guide on what to see and where to eat throughout your stay in this beautiful French Riviera city. What Nice City Bike Tour Includes? A children's seat for infants 1 year and over is available on request. Pack a drink or snack in a backpack so you can revive the energy levels if needed. Travelers Reviews about Nice City Bike Tour? Travellers talking about this tour on GetYourGuide, Viator, and TripAdvisor give it great reviews saying it was an excellent experience and a really great way to get acquainted with the city. It has only received 1 bad review from over 150! Travellers say that the guides are knowledgeable and friendly, stopping often to give background information on the city and the sights as well as providing tips on the best places to eat and drink. People say they have taken other city bike tours but that this one was the best they've been on so they highly recommend it to others. People in their 60's and people of a 'medium' fitness level report being able to manage this city bike tour comfortably, apart from 1 moment; the climb to the viewing point but then they say the effort was well worth it for the views and there's always the option of walking up with the bike! Dress comfortably and sensibly with flat shoes and no flowing clothes that might get caught in the wheels. Meeting point at the seafront - Further instructions given in the booking email.